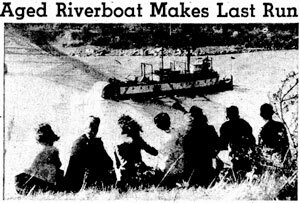 By mid-century competition from the railroad, and later, paved roads and automobiles, spelled the death knell of Columbia River steamboat operations. One of the last steam powered sternwheelers to regularly ply the waters of the Columbia River was the Georgie Burton. After 41 years of service, she made her final trip from Portland to The Dalles on March 20, 1947. This page feels sentimental about the occasion for any number of reasons. For one thing, the boat, launched at Vancouver, Wash., on the day of the San Francisco fire, was christened for Mrs. H. L. Pittock, Georgie Burton being Mrs. Pittock’s maiden name. The plan was to convert the Georgie Burton into a marine museum for a future waterfront park in The Dalles. Unfortunately a flood the following year tore her loose from her moorings and she was wrecked.